As I have taken up the challenge of completing 365 blogs by the end of March 3rd,2013, it has been rigorous blogging from almost last 4-5 days. Everyday I need to invest a solid good amount of hours to rack my brain for different valuable topics and brainstorm through different ideas on blogging about them because I can't go under-quality on my blogs. While I am doing so, the mounting pressure of writing 11 blogs a day just keeps growing in my head. If I miss blogging in the morning, I have to sit for hours continuously in front of my laptop typing out until I finish my target for the day. Sitting in front of the laptop is what I hated and it was one of the prominent reasons for me to leave Oracle which was a software company. Now that my goal is very near and clear on my mind, I need to be steadfast in my approach and can't miss anything on the path to reach it. 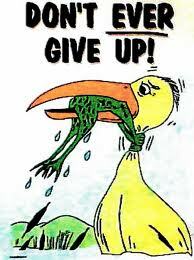 At such times, I also feel like giving up due to frustration or other reasons. I have even heard of people who take up Ph.D's feel the feeling of giving up while they are half-way through their journey of studies. This feeling doesn't make one a failure. It's bound to occur when we are desperate to reach the goal but are just astonished by the surmountable work in front of us.